You might have heard the rumblings, you might have seen a teaser, you might have made the wish in your heart, but the rumors are true! 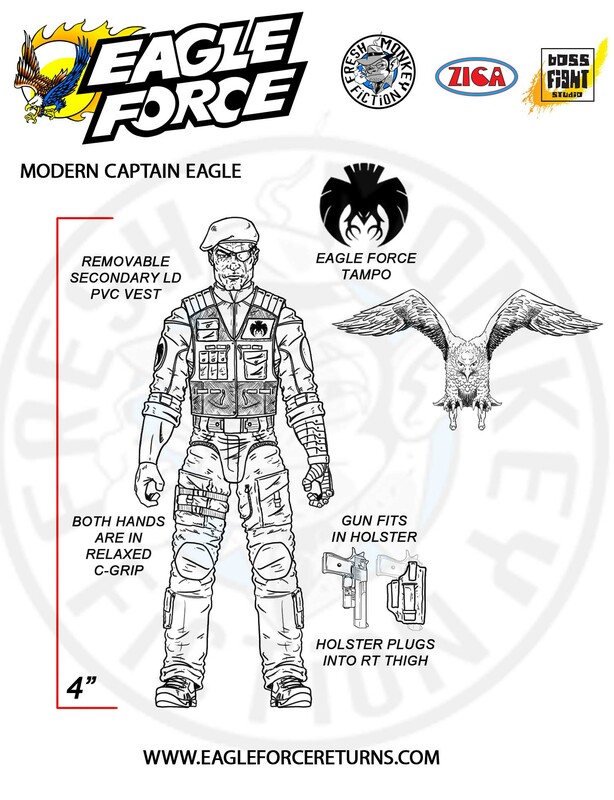 Mego’s 1980’s era military action figure line “Eagle Force” is poised to make a comeback in 2015! We caught up with the Fresh Monkey himself, Bill Murphy to get the scoop on the proposed relaunch of this line. He fills us in on the details AND let’s us reveal one of the designs for a wave one figure! AFi: First off – Why Eagle Force? Fresh Monkey Fiction: I loved Eagle Force as a kid, I had most of the characters, vehicles and Eagle mountain. 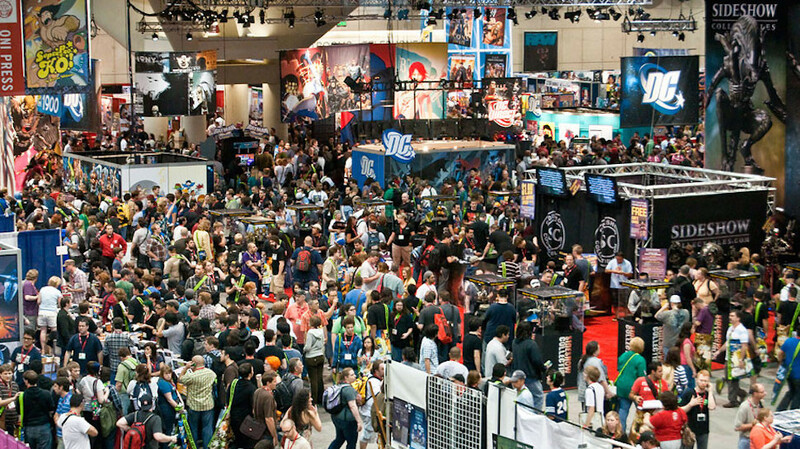 I really gravitated to the line cause of the comic book art and character diversity. As far as why we’re revisiting Eagle Force now, I feel that there is an opportunity to fill a huge void in the market place for 4″ military figures that have a exciting storyline and deep character development. I thought it would be great to revisit the Eagle Force characters 25+ years later and see where they are today. 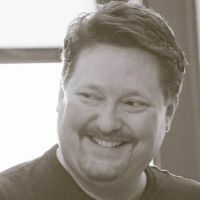 AFi: For those that might not be as familiar, tell us about Eagle Force about the history of the line? 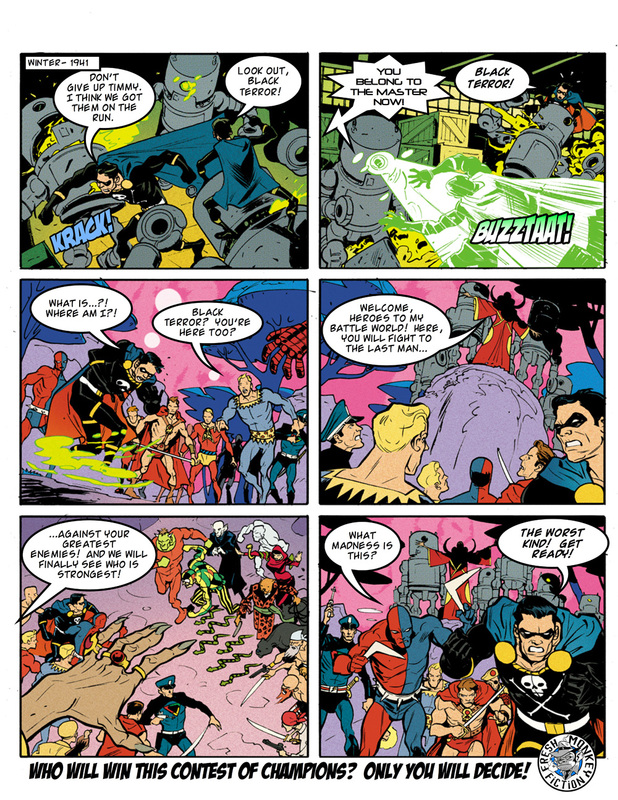 FMF: Eagle Force was created by Paul Kirchner for Mego in the early 80s. They were 2″ die-cast metal military figures. The story behind the line centered around Eagle Force, who was formed by the US Government to combat R.I.O.T ( Roving International Organization of Tyranny). a global terrorist organization. Paul Kirchner beautifully illustrated the adventures of Eagle Force on the packaging. The back of each figures packaging had a 6 panel comic strip that spotlighted the character along with their weapon of choice. AFi: The original Eagle Force figures were 2″ scale. Are you going to keep that scale? Also the original figures were die-cast metal, will that be true in this new incarnation? 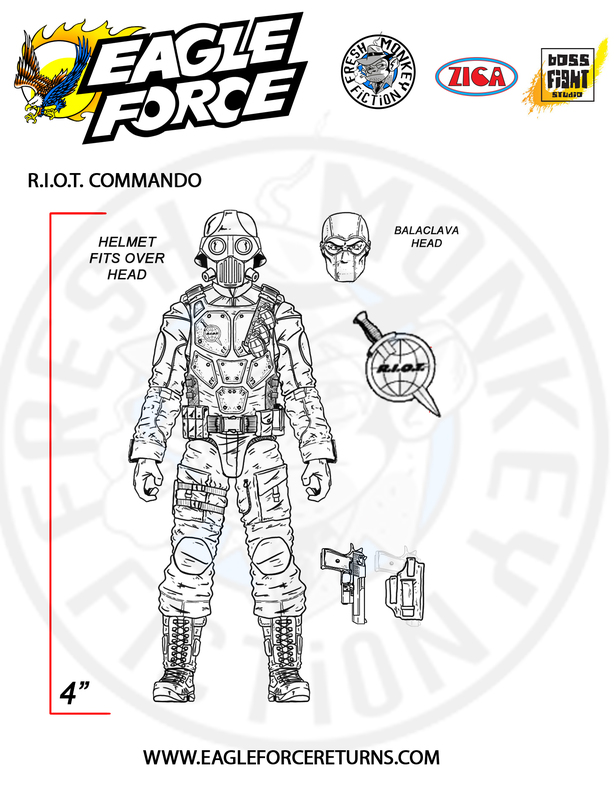 FMF: This new line will fit in with more modern day multi-articulated 4″ figures, they will not be metal. AFi: One other thing that the Eagle Force figures were known for were their cards looking like comic books. Is that something that will be incorporated into the new line? FMF: Absolutely, we are planning to have similar packaging to the original line. AFi: What part are the gang from Boss Fight and Zica playing in the new Eagle Force line? 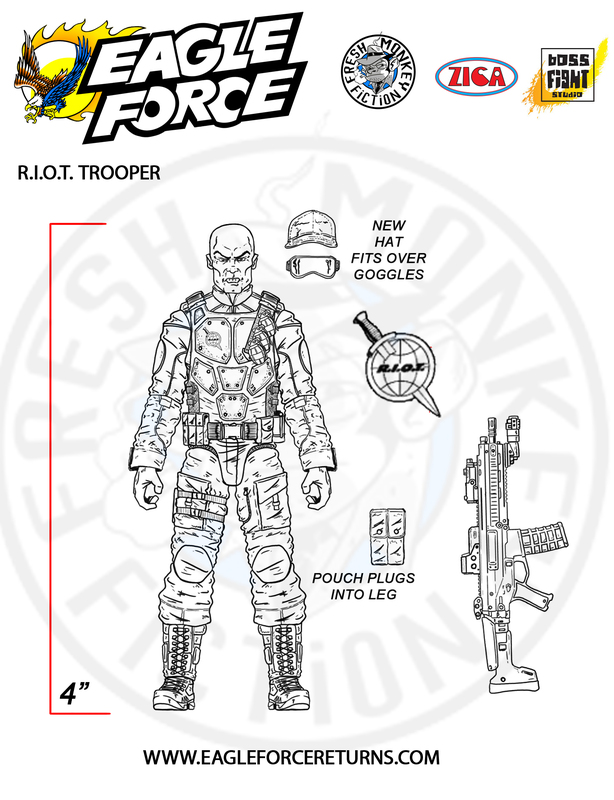 FMF: The new Eagle Force line will be co-produced by Fresh Monkey Fiction and Zica Toys, with design and sculpting by the talented Boss Fight Studios. AFi: I know you are doing some slow reveals, but can you give us an over all idea for your plans for the line? FMF: For those “eagle” eyed fans, Captain Eagle made a small brief cameo as a background character in the last 2 panels of the comic on back the packaging for our Amazing Heroes line, which we will release next summer. We’ve revealed the designs Captain Eagle and the R.I.O.T. Trooper, and we’ll be revealing more characters in the coming months. Keep watching http://www.eagleforcereturns.com for more details and reveals! This line would, indeed, fill in a huge void …now that G.I. Joe has been retired once again. I hope the funds are there to get us all the original characters along with the unproduced wave. Army builders would be icing on the cake, of course. Looking forward to seeing how this project pans out, but I’m feeling mighty confident right now.